Karl Gotch recieved his training at the famous “Snake Pit” Billy Riley Gym in England and won a number of tournaments in Europe..
1959: Karl Gotch started competing in the United States of America but was not accepted due to his “Shooter” style.. 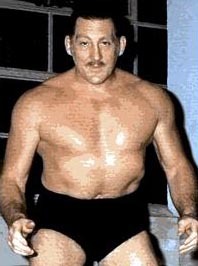 When Karl Gotch began in the Al Haft Promotion in 1959 as “Karl Krauser”, he could not speak English..
1962: Karl Gotch was rumored to have attacked NWA World Champion Buddy Rogers in the locker room for rufusing to wrestle him..
~~~Karl Gotch & Bill Miller each post a $25 bond and were released..
September 14, 1962: Karl Krauser (AKA: Karl Gotch) wins the MWA title from Don Leo Jonathan in Columbus, Ohio..
Karl Gotch trained many Japanese stars such as Antonio Inoki, Hiro Matsuda, Tatsumi Fujinami, Osamu Kido, Yoshiaki Fujiwara..
Karl Gotch was considered a “God of Professional Wrestling” in Japan..
July 28, 2007: Karl Gotch passed away just a few days shy of his 83rd birthday..
Dave Meltzer (via WrestlingObserver.com) wrote: Karl Charles Istaz, known internationally as Karl Gotch, passed away at 9:45 p.m. Eastern time tonight. He was a few days shy of 83 years old. A former place-winner in the 1948 Olympics in London, Istaz went to the famed Wigan school where he learned submission wrestling. He migrated to the U.S. where he had a reputation in some circles as the toughest man alive. He ended up becoming a legend in Japan, where he was eventually nicknamed “The God of Professional Wrestling.” He was the trainer for New Japan Pro Wrestling and later the original UWF, and his influence in students like Akira Maeda and Nobuhiko Takada led to the rise of shootfighting and eventually MMA in that country.